Now you can charge your Samsung Galaxy devices including the S4 without plugging and unplugging cables every time. This wireless charging back cover and charging pad makes it much easier to keep your battery charged and is compact so uses minimal space. Charging is effortless, just check the handy LED indicator to see charging status at a glance. This pad works for most Samsung devices, but note that the S4 mini is not QI charging compatible. To use simply put your device onto the Wireless Charging Pad and that’s it, no more fussy connections and if the handset rings just pick it up and answer! The Samsung Wireless Charging Pad is Qi-certified by the Wireless Power Consortium, so is designed to reduce power consumption by minimising heat generation and thereby increasing charging efficiency and reducing charging time. This slim wireless charging pad is a perfect fit for devices such as the Galaxy S4, but you do need a compatible Wireless Charging Cover which is sold separately. As the official charger for Samsung mobile phones, this charger will charge Samsung devices quickly and easily, but is also compatible with all other QI wireless receivers including Nokia. The official case for the Galaxy S4 is rated at 650mA, a lot less than the USB adaptor which is rated 2A, so don’t expect to charge your Samsung devices wirelessly as quickly as you can by plugging into the USB charger, but most devices will fully charge if left overnight (roughly it will take around twice as long to charge using wireless versus plugging into conventional USB port). 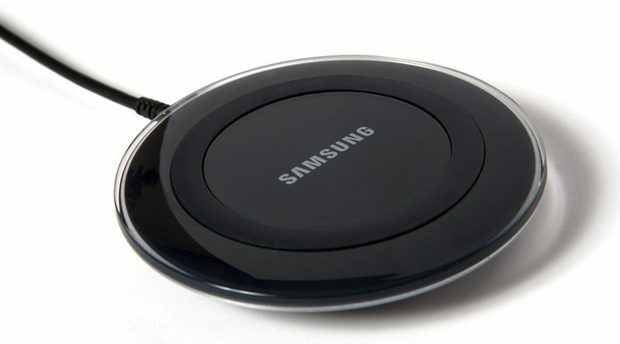 Another advantage of this wireless charging pad is that is is built by Samsung, so you can be assured of top quality and perfect compatibility with supported Samsung devices.